I hadn't meant to write about this, but somehow I found myself doing it. 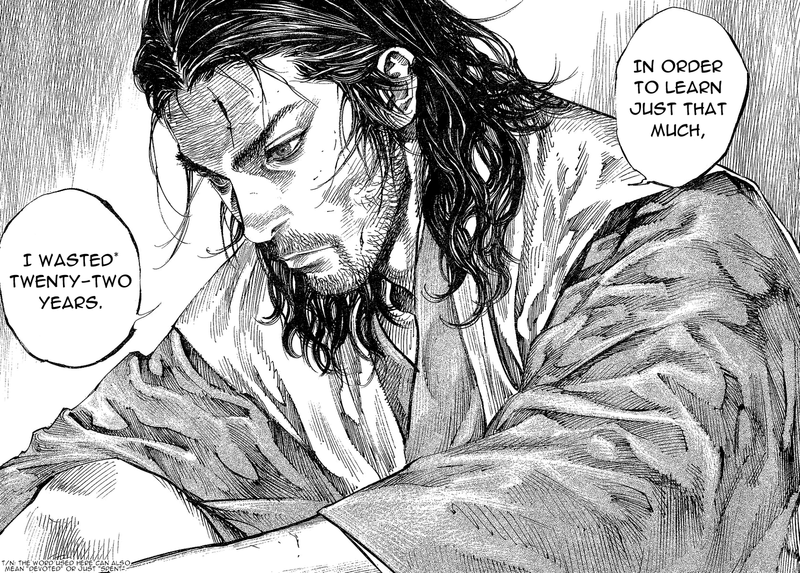 I think I have mentioned Inoue's marvelous Vagabond before, but it's one of those things you can't have too much of. Of all the swordsmen of Japan, Miyamoto Musashi is probably the one who has caught the imagination most strongly: the subject of plays, novels, non-fiction, several TV series and movies, and of course his own writing continues to sell well to this day. And, like many figures from the past, our knowledge of Musashi is colored by these many fictional renditions of the character. While western audiences often dwell on the violence of his life, impressed by his record of victories in duels, the Japanese view is more nuanced, and tends to take personal development as its major theme. The most famous example of this approach is the novel Musashi by Yoshikawa Eiji, originally released in serialised form in the 1930s. Musashi is depicted as a young man looking to develop his skills to become the strongest swordsman in the country. The depiction shows a driven, single-minded, yet chivalrous character, who grows as he learns from the pain and sacrifices involved in the pursuit of his dream. His childhood friend, Matahachi acts as a foil to Musashi – a kind of everyman who follows his whims, doesn’t have the strength of character to suffer for his dreams, and tries to achieve success without achievement. The contrast between the two is clear, though many will see as much of Matahachi in themselves as Musashi. 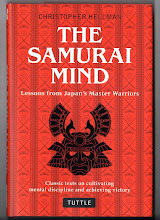 The other major character who sets Musashi in relief is the swordsman Sasaki Kojiro – and the novel uses the readers knowledge of their climactic duel to create an ongoing tension between the two characters. 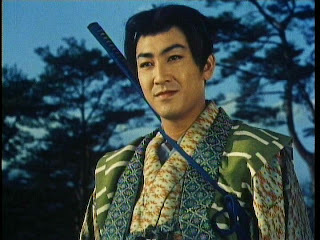 Although a consummate swordsman, he appears as a man who has arrived, and is confident of his position and worth. Cool and assured – he displays no doubts when it comes to his art, wielding his sword with a cold, arrogant precision. (I must admit to liking Tsuruta Koji's portrayal of his character in the Samurai Trilogy starring Mifune Toshiro far better than Mifune's Musashi). This rendition of Musashi has been the predominant one for many years. It has been a pleasure, therefore, in the last ten years or so, to see a powerful reworking of Yoshikawa’s themes in the hands of one of the premiere contemorary manga artists, Inoue Takehiko. 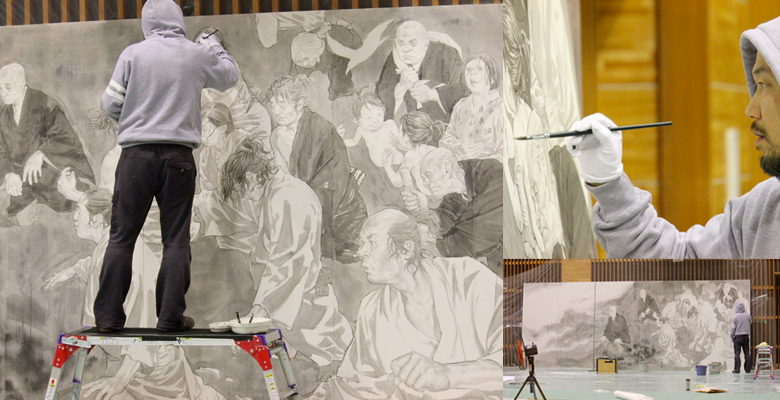 As a medium, manga is broad and multi-faceted, with all the variation one might expect of such a popular and widespread art form. At its best, it combines the depth of graphic novels with the continuity and addictiveness of a long running TV series. Vagabond, Inoue’s manga based on Yoshikawa’s novel, currently runs to 33 collected volumes, with about 200 pages per volume. Not only is the art several cuts above the norm in manga - he started in pen and ink but later shifted to brush - and in his larger public works has extended the range of this individual form of ink painting - ichinin: ippa (one man: one style) indeed - but the story continues to hold and fascinate a huge readership (22 million copies have been sold worldwide!!). 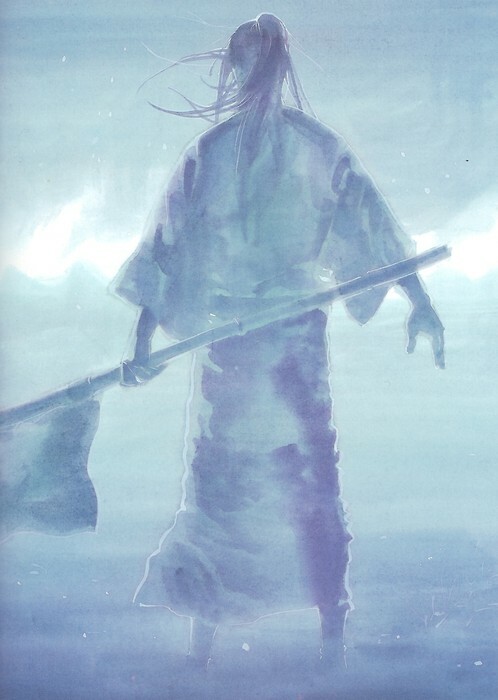 One of his major innovations is his reworking of the Kojiro character, giving him an extensive backstory and portraying him far more sympathetically than in the original novel. The artist’s strong identification with his characters has also been the cause of problems. In an interview for the NHK documentary Professional no Ryugi (September 2009), he revealed how difficult it has been for him to continue with the darker sides of the story, and as the series moved towards its conclusion and the ultimate death of Kojiro, he seems to have stalled, unable to continue. ...but I do hope he manages to finish the Vagabond series. Click Vagabond Manga series. You can also check out MangareadersCo to read more manga series. Enjoy reading.